First Clinical Tomorrow in Oncology... Any Tips? Too sensitive to be a nurse? Thank you all! I consider myself extremely lucky to have such compassionate and insightful people respond to my post. I REALLY appreciate you guys taking the time to give me a little encouragement. 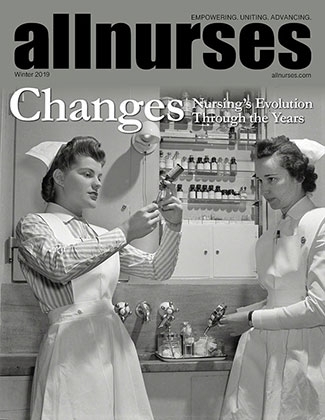 Allnurses is awesome! Thank you, Miranda. You offered some very insightful advice. I do know that while I am a very sensitive person (I'm known for crying at Hallmark commercials and the occasional Full House rerun), I do have some preexisting emotional issues when it comes to animals... when I was about 9 years old, I accidentally ran over a 4 week old kitten with a rocking chair. I'll never forget how horrible and guilty I felt because I was the one who was responsible (although looking back, I can see it was just a freak accident). I placed a lot of blame on myself for that one. I haven't sat in a rocking chair since, and I also haven't found a way to deal with animal (especially BABY animal) death better either. Thank you again. I'm definitely going to investigate myself further, and hopefully I'll learn some coping mechanisms so that I can handle the whole dying process a little better. And if not, I will certainly pursue a nursing position where death isn't quite so prevalent. Thank you soooo much everyone. Your comments are definitely helping to restore my confidence a bit. I appreciate all of the encouragement!! I'm really concerned that my sensitive nature will make it difficult for me to be a good nurse. Recently I had a few incidents with animals dying while in my care, and I didn't handle myself well AT ALL. About 2 years ago, I adopted a kitten and two days later she passed away (apparently had some kind of bacterial infection). Over the course of those two days, I took the kitten to the vet four times (sent home each time with new remedies to try), and had to watch the kitten suffer until she was finally too weak/sick and had to be taken back in to be euthanized. My husband had to take her in because I couldn't handle it, and I cried for weeks afterwards. A few weeks ago we took in a pregnant cat, and last week she had her kittens... 2 of them were stillborn, and I couldn't even bring myself to look at them or remove them from the box. Again, my husband had to take them to the animal shelter. And yesterday, one of the kittens somehow suffered some trauma (he had swelling in the head and labored breathing). As soon as I realized something was wrong with him, I had my husband rush him to the vet. He didn't survive, and I'm still hysterical in tears about it. I have a little over one year left in my BSN program, and because of these experiences I've had, I'm seriously doubting that I'm cut out to handle the nursing profession. I love nursing, and I'm absolutely fascinated by everything I'm learning. I'm really hoping my oversensitivity to kittens doesn't doom me for a career in nursing. It's a good thing I didn't follow through with my childhood dream to be a veterinarian! Any input, advice, etc would be GREATLY appreciated! !